The following report was obtained from the National Transportation Systems Center library. Provided these challenges are largely mitigated, the following are projections of UAS fleet size by user in 2035: Department of Defense ~14,000, with additional ~5,000 having optional pilot augmentation (Air Force ~3,500; Navy + Marines ~2,500; Army ~10,000); Public Agencies (Federal, State, & Local) ~70,000. 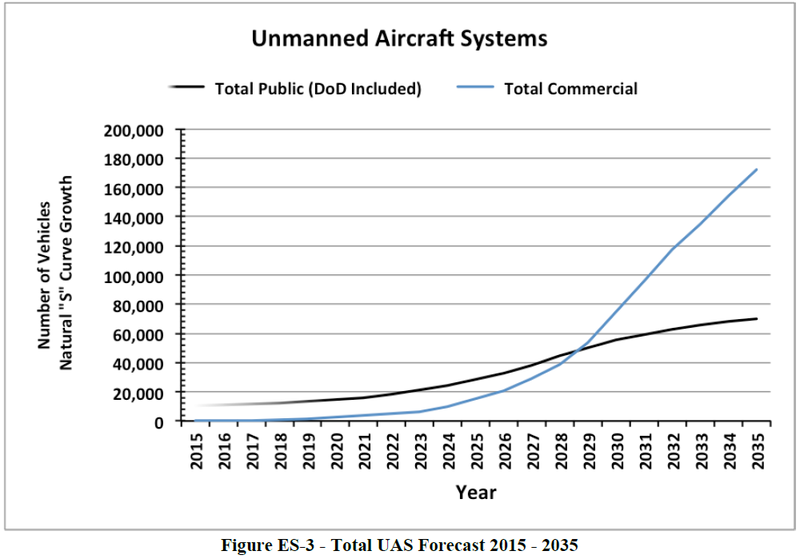 Total UAS vehicles will approach ~250,000 by 2035, of which ~175,000 will be in the commercial marketplace. 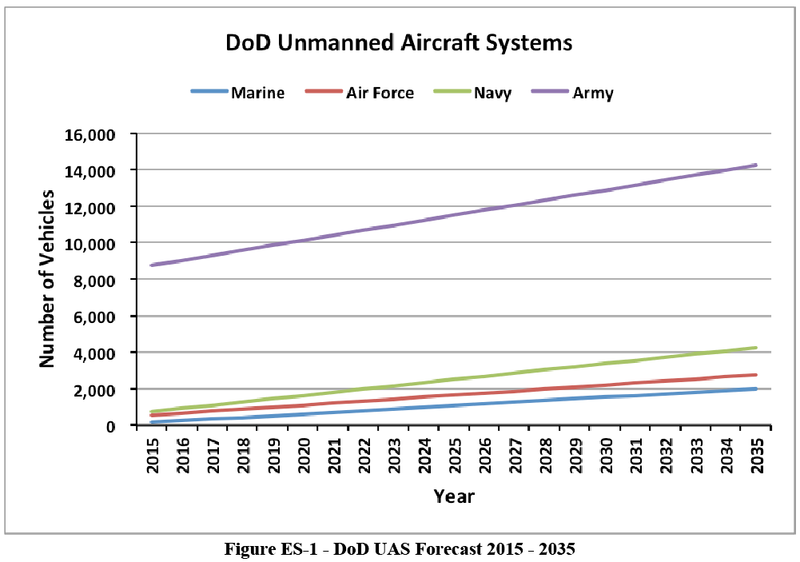 UAS operations are expected to surpass manned aircraft operations, for both military and commercial domains, by 2035. The global defense industry is currently investing heavily in research and development, which has led to the development of technologies to enhance the endurance, survivability, and usability of UAS. This paper identifies five major UAS subsystem technologies that are seen as enablers for both military and commercial Unmanned Aircraft Vehicle (UAV) market development and growth: airframe; power plants; sensors; communication, command, and control (C3) systems; and information technologies (IT). Each of these subsystems will be driven at varying paces, depending upon research and development investments coupled with the financial viability of emerging markets. Some of these technologies, such as IT, are rapidly developing because of the high growth in user demand and the development of web-based services. Some of the many mission characteristics and requirements that will drive future UAS development include: light weight (composite structures), long endurance, high payload carrying capacity, and interchangeability between standardized payload modules. Continuing microminiaturization, sensor fusion, C3 standardization, and infrastructure integration will result in smaller and more capable UAVs. They will also be more efficient and less costly. In other words, more capability at less cost encourages more market growth. While technology enables, it is the cost effective delivery of capability that meets the need that drives UAS markets. Identification of mission needs is foundational to forecasting future types and number of UAS. 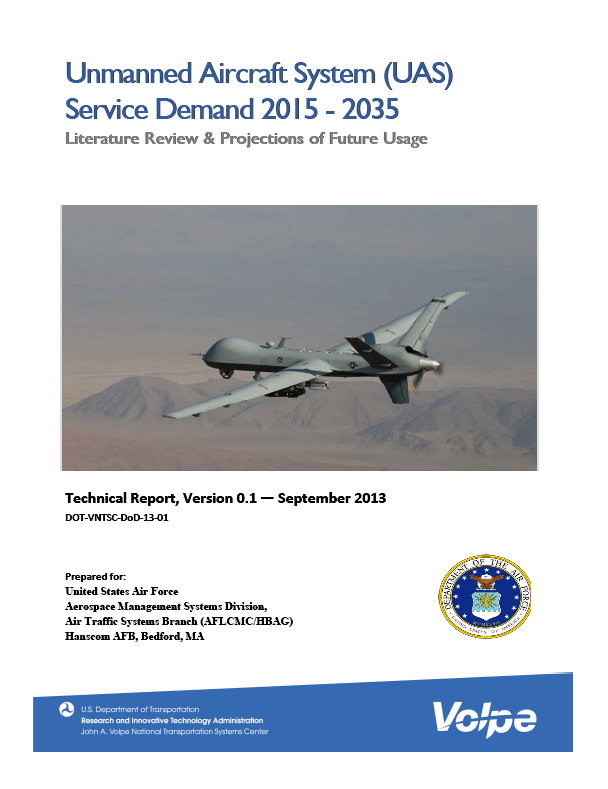 This report considers major mission requirements to continue to be in intelligence, surveillance and reconnaissance (ISR), as well as new areas such as stores delivery, cargo transport, search and rescue, and pilot augmentation. Mission need is tightly coupled with technology, meaning that technological developments are mission enablers in the same way that mission requirements drive technological changes. Historically, UAV use has been primarily by the military in war zones, and in restricted airspace within the U.S. As such, UAV designs did not fully consider longevity or robustness which is important for operation in the NAS. New domestic missions and vehicles present a totally different picture. The anticipated expansion of UAS into a myriad of public, private, and commercial missions routinely using the national airspace alongside other air traffic has highlighted both operational needs and public concerns associated with UAS operations. A business model tells the story of the business and how the elements of that business work together to produce value that a customer would want. The model also describes how the business differentiates itself from other competition in the same product area.1 This report relies upon research from a Massachusetts Institute of Technology team, who in 2005 examined the business models of the largest 1,000 U.S. firms2; the MIT research team found that business models were a better predictor of operating income than existing business segment classifications. If this is the case, then a business model can be used to test a range of approaches for generation of revenue for UAS applications. If a business is to receive financing to start up (the case with nearly all civil applications using UAS) then a good business model must consider customers, cost, revenue, and the value proposition for the product or service being delivered. At the moment, there are major constraints to the use of UAS due to the underlying number and complexity of issues regarding operating UAS in the NAS. To this point, initiatives to promote and facilitate the use of UAS in civilian applications have been relatively uncoordinated and ad-hoc. Another challenge is pilot training and certification. Future users of UAS have to prove that they can operate (piloted from the ground or autonomously) safely. The military has been leading the training and certification process, including rules, pilot certification processes, and training and simulation requirements. The military anticipates leading the future of UAS operation training and certification into the NAS. Additional challenges to UAS market growth for operations within U.S. include: regulatory, policy, and procedural issues; social issues, such as privacy and nuisance concerns; environmental issues, such as noise and emissions; and safety. While existing restrictions and procedures for the operation of UAS in the NAS mitigate safety concerns for other air traffic and persons and property on the ground, the Federal Aviation Administration (FAA) is currently developing regulations for safe and routine UAS operations in the civilian NAS. A final key area is the perceived concern for privacy. Even when the technical and safety concerns are overcome, there is still a growing challenge to widespread use of UAS in the NAS brought on by the public’s privacy concerns. This is due to the widespread belief that only use for UAS is intelligence, surveillance, and reconnaissance (ISR). Most stakeholders, including FAA, recognize the time and cost challenges these policies and procedures place in the way of achieving UAS benefits. As a result, efforts are underway through the RTCA Special Committee 228 to address a myriad of issues associated with integration of UAS into the NAS. Timely deployment of UAS into the NAS is dependent upon reducing, circumventing, and eliminating these and other challenges.